Due to the complexity of integration, this product is sold as a completely assembled system only (with minimum 2 CPUs, 2 DIMMs, 1 HDD/NVMe and 1 SIOM card per node). No-compromise 5th Generation Twin architecture delivers the highest performance and efficiency in a 2U 4-node platform. The first and only multi-node system that supports the widest TDP range of CPUs (up to 205 watts), fully exploits all memory channels with 24 DIMMs per node and 24 AllFlash NVMe drives. 100% more I/O capacity and added flexibility with more than 10 networking options including 1GbE, 10G, 25G, 100G, IB and industry leading SIOM modular interconnect. Each node can support current and next generation dual Intel Xeon processors with up to 3TB of memory, 24 drives of All-Flash NVMe, Hybrid NVMe/SATA/SAS, SSD and HDD, plus 2 m.2 NVMe/SATA per node. The Supermicro BigTwin is a breakthrough modular multi-node server system that eliminates traditional modular vs rack computing design trade-offs. BigTwin is the 5th generation in the patented Supermicro Twin Family with a multitude of innovations and engineering breakthroughs. The no-compromise architecture delivers the efficiency of multi-node density optimized systems with the full features and power of traditional 1U and 2U rack mount systems. The key benefit of BigTwin is the no-compromise design. Historically multi-node systems traded off features and capacity for higher density. They were deployed for workloads that did not require the highest performance or the highest memory density on a single node. The new 2U BigTwin design is a breakthrough multi-node system that supports the highest performing CPUs, full 24 DIMMs of memory and up to 24 all-flash NVMe SSD drives. Supermicro has been a leader in introducing NVMe support and advanced NVMe features in our product portfolio and BigTwin continues that tradition. BigTwin supports 24 hotswappable 2.5” U.2 NVMe drives, or mixed configurations with SAS3 and SATA3 drives (varies by different BigTwin models). Leveraging Supermicro’s building block architecture BigTwin is a shared design with common components where most multi-node systems are one-off designs with limited leverage and integration to the rest of the product family creating sub-optimal service, sparing and training. The building block design also allows the system to be optimized to the specific requirements of the intended workload. The 24 DIMMs can be used to deliver better performance and responsiveness for database and cloud infrastructure workloads, as well as providing the flexibility to customers looking to invest in lower capacity DIMMs for lowered dollar per GB solutions. A hyper-converged solution of 3 nodes plus a hot spare can be hosted by just one BigTwin server. 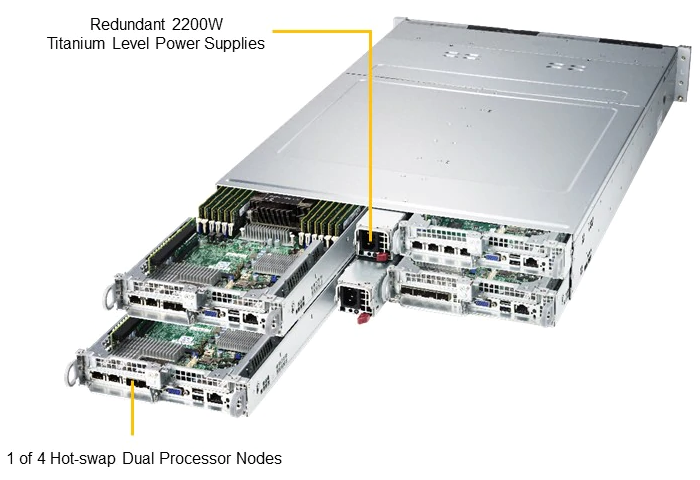 Each node can support dual Intel Xeon E5-2600 v4/v3 processors with up to 3TB of memory, 2 NVMe SSD drives for caching and 4 SAS drives for datastore. The Supermicro BigTwin is a breakthrough modular multi-node server system, an ultradense and energy efficient powerhouse that provides industry leading performance perwatt, per-dollar, and per-squarefoot. 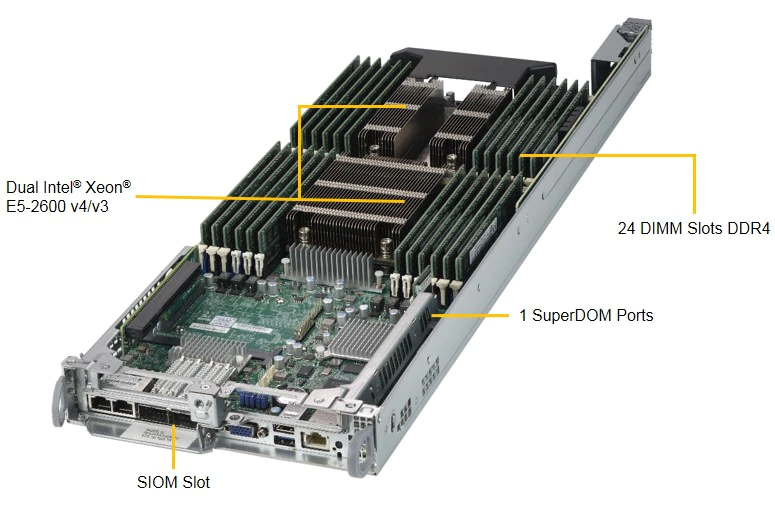 Supermicro Super I/O Module (SIOM), common across both Rack and Modular platforms, delivers up to 50% I/O cost savings and freedom to select networking options from 1Gb/s to 100Gb/s. The SIOM enables a tighter system integration and leaves a total of two PCI-E 3.0 x16 LP slots for storage or networking add-on-cards on each node. 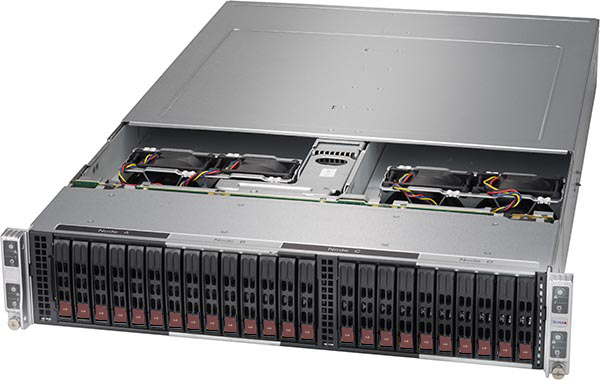 Supermicro introduces its 5th generation Twin architecture the X10 BigTwin. With its no-compromise design, it is the industry’s highest performing 2U multi-node platform. Introducing BigTwin, the IT industry’s highest performing twin multi-node system with 4 nodes in 2U supporting the highest performance 205-watt DP Intel Xeon E5-2600 v4/v3 product families, a full 24 DIMMs of memory per node, 24 All-Flash NVMe or hybrid drives, three PCI-E 3.0 x16 I/O options per node, and an industry leading 30% better thermal capacity for maximum performance, efficiency and free air cooling (1.05 PUE). 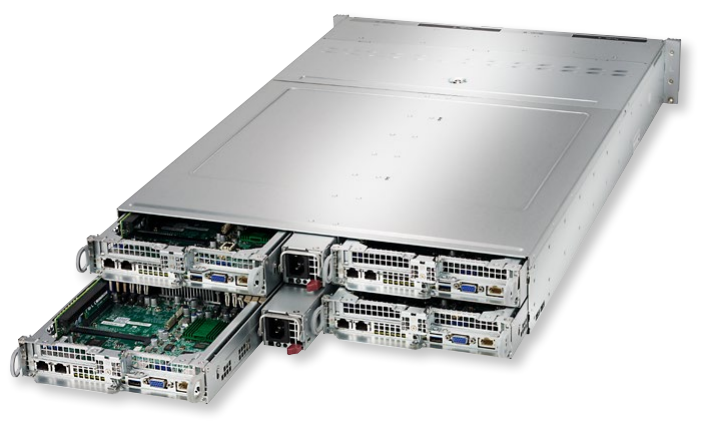 With Supermicro’s 96%+ high-efficiency, fully redundant 2200W, 2600W PowerStick design and advanced thermal architecture. The BigTwin is optimized for today and future proofed for the next generation of technology breakthroughs advancements, including new generation Intel Skylake processors.